LOCATION.--Lat 42°04'29", long 75°23'46" referenced to North American Datum of 1983, Delaware County, NY, Hydrologic Unit 02040101, on right bank at Stilesville, 0.5 mi upstream from Cold Spring Creek, 1.4 mi downstream from Cannonsville Dam, and 2.0 mi northeast of Deposit. PERIOD OF RECORD.--July 1952 to current year. REVISIONS HISTORY.--WDR NY-05-1: 1973, 1977, 1979, 1986, 1993, 2004. 2014: Daily temperature. GAGE.--Water-stage recorder and concrete control. Datum of gage is 992.23 ft above NGVD of 1929 (levels by Board of Water Supply, City of New York) and 991.68 ft above NAVD of 1988. Prior to Oct. 1, 1964, at site 600 ft downstream at datum 1.37 ft higher. REMARKS.--Subsequent to October 1963, entire flow from 454 mi² of drainage area controlled by Cannonsville Reservoir (station 01424997). Part of flow diverted for New York City municipal supply. Remainder of flow (except for conservation releases and spill) impounded for release during period of low flow in the lower Delaware River basin, as directed by the Delaware River Master. Water Years 2014-17: Records fair. EXTREMES FOR PERIOD OF RECORD.--Maximum discharge, since construction of Cannonsville Reservoir in 1963, 33,100 ft³/s, June 28, 2006, gage height, 17.72 ft; minimum discharge not determined. EXTREMES FOR PERIOD PRIOR TO REGULATION.--Maximum discharge, prior to construction of Cannonsville Reservoir in 1963, 17,500 ft³/s, Jan. 22, 1959, gage height, 9.01 ft, site and datum then in use. PERIOD OF DAILY RECORD1.-- WATER TEMPERATURE: October 1962 to current year. INSTRUMENTATION1.--Water-temperature satellite telemeter provides 15-minute-interval readings. From October 1975 to February 1993, water-temperature recorder provided one-hour-interval readings. Prior to October 1975, water-temperature recorder provided continuous recordings. REMARKS1.--Temperature readings prior to Oct. 1, 2007, rounded to the nearest 0.5 °C. Water temperature is affected by release of water from upstream reservoir. Interruption of record was due to malfunction of recording instrument. EXTREMES FOR PERIOD OF DAILY RECORD1.--WATER TEMPERATURE: Prior to Oct. 1, 2007--Maximum (water years 1963-78, 1980-82, 1984-86, 1988, 1990-92, 1994-95, 1997, 1999-2002, 2004-07), 30.5 °C, July 2, 1963; minimum (water years 1963-95, 1998-2003, 2006), 0.0 °C on many days during winter periods, except 1969, 1973, 1986-87, 1990-91, 1994-95, 2001, 2006. WATER TEMPERATURE: After Oct. 1, 2007--Maximum, 21.9 °C, Aug. 1, 2, 2009; minimum, 0.0 °C, Feb. 20, 2015. USGS provisional real-time discharge data can differ from NYCDEP discharge data at flows less than 2,100 ft3/s as a result of debris or other obstructions affecting the USGS stage-discharge relationship. 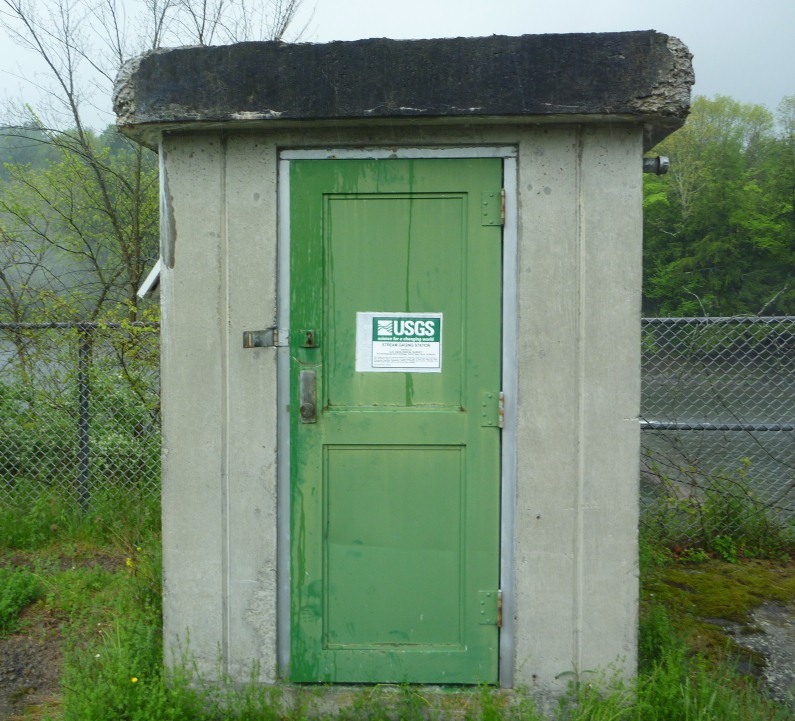 USGS and NYCDEP data may also differ as a result of accuracy limitations of the stage-discharge rating and the release valve ratings. Release valve changes are recorded at the stream-gaging station after a brief period due to travel time between the two locations.